Envision Glass was established in 2012, but our roots go back much further. Our President Craig Simmons has a heritage in the Glass business that dates back over 35 years. Craig began working for his father in the glass industry when he was 12 years old where he spent his weekends and summers cutting glass, completing storm window repairs, and repairing windshields. Shortly after graduating from high school, Craig began installing commercial storefronts and curtainwalls. Craig has experience working with business owners, home owners, general contractors, and architects on projects ranging from broken glass in a home to multi-story curtainwalls. Craig says of his approach to the glass business, “I feel that all projects are important and I make it a priority to meet all of the customer’s needs and exceed their expectations. We are a proud member of the Bulldog Group based in Winston Salem, NC. Our association with this group gives us the resources that we need to handle any size project. Please feel free to visit the Bulldog Group website to learn more about the group and find out what how we can assist you in other areas of the construction industry. 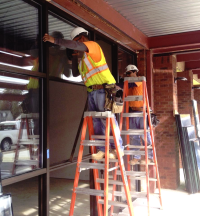 Since its inception Envision Glass Inc. has completed many different projects from North Carolina, South Carolina, Virginia, and West Virginia. We are privileged to work with companies such as KFC, Ralph Lauren Polo,Taco Bell, Mercedes Benz, Tanger Outlets, UNC Health Systems, and many more. We look forward to speaking with you about your aluminum and glass needs. Please contact us for more information.